Motorcoach Country Club. Golf Motorcoach Indio. Motorcoach golf course details and information about Motorcoach Country Club in Indio, California. 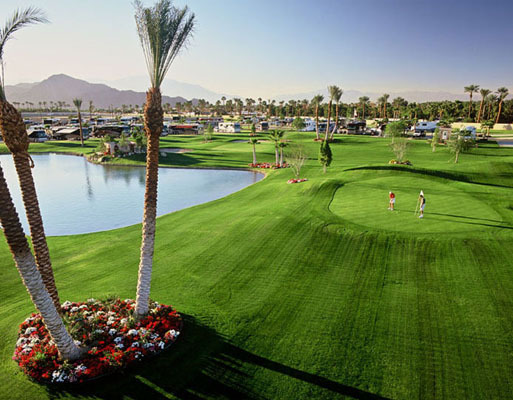 Motorcoach Country Club Indio is located in South California near Palm Springs. It is a short private course, at 9-holes and par 3. It is open to MCC Resort Owners and Guests only. It’s sunny location and desert climate make it great for golf. Motorcoach golf course features stunning views, lots of palm trees, and rolling hills. It is a beautiful place to spend the day relaxing or enjoying other amenities the club has to offer. In addition to golf, Motorcoach includes a clubhouse, a spa, 3 pools, and 3 tennis courts.